After years of making loops with a dual-cassette recorder, my BFF Jeff finally got this Roland MS-1 in '95. 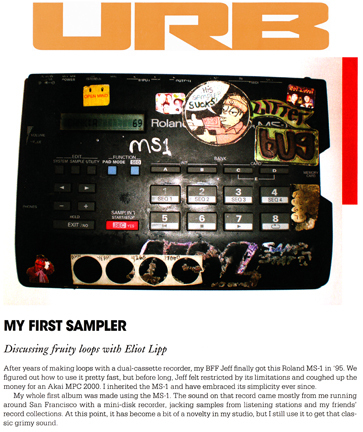 We figured out how to use it pretty fast, but before long, Jeff felt restricted by its limitations and couphed up the money for an Akai MPC 2000. I inherited the MS-1 and have embraced its simplicity ever since. My whole first album was made using the MS-1. The sound on that record came mostly from me running around San Francisco with a mini-disk recorder, jacking stations and my friends' record collections. At this point, it has become a bit of a novelty in my studio, but I still use it to get that classic grimy sound.